In some ways Susan Dellinger is a born historical novelist. Her narrative in Red Legs and Black Sox, although not always true history, stands firmly on a base of real, and newly revealed, events. Dellinger’s research for this book uncovers the connection of baseball’s shocking 1919 Black Sox Scandal not with sophisticated New York and Arnold Rothstein the consummate gambler, not with big-city Chicago or St. Louis, among their fixers and bettors, but with good old Porkopolis—Cincinnati, Ohio, then a second-rank city—and among some of its solid citizens at that. From this book we know now that a group of Cincinnati heavy bettors had such good contacts with the bribers that they knew well in advance that the World Series of 1919 would be crooked. In the course of presenting the story of the 1919 scandal from the point of view of Cincinnati, Dellinger has uncovered several zingers, for example: Jimmy Widmeyer, a Cincinnati friend of Edd Roush, the team’s star player, told Roush after only the second game of the World Series that the White Sox, Cincinnati’s opponents in the series, would throw the games. Roush learned the news in the course of buying a diamond ring for his wife Essie, getting a deal through Widmeyer, who was a friend of one of the biggest cheaters in baseball, player Hal Chase. Roush didn’t realize that what Widmeyer told him wasn’t mere gossip but that Jimmy was actually in on the fix. There’s more. Two of the Cincinnati gamblers who knew about the player bribery were such great friends of the Cincinnati Club owner, August “Garry” Herrmann, and another important stockholder, Julius Fleischmann, that they actually traveled to Chicago game with the two Cincinnati club officers in Herrmann’s elaborate private drawing room car. What do you think they talked about during this train trip? The baseball establishment knew that the 1919 World Series would be crooked. Another revelation is Edd Roush’s angry announcement to his teammates in the Cincinnati locker room before the games that he had heard somebody on his own club “doesn’t want to win” because gamblers had gotten to some players, and that he’d be watching his teammates’ every move for signs of crookedness—whereupon pitcher Hod Eller admitted that he had already been approached by gamblers with a ten-thousand-dollar bribe to lose the game, refusing it indignantly. Years later, Roush continued a firm belief that another teammate, Dutch Ruether, who had mixed frequently with known gamblers, had tried to undermine the Reds’ successful effort to win the 1919 series. With events like these happening and known to the owners, why wasn’t the whistle blown before or during the games? Because, as the late historian Gene Carney pointed out when he wrote Burying the Black Sox (Potomac, 2006), the owners wanted to cover up anything suspicious in order to protect their investment. Their effort almost succeeded—shades of the recent steroid scandal in which the present-day owners almost managed to keep the fact of players’ drug use under wraps by pretending it wasn’t happening. They nearly succeeded, too, despite the efforts of two determined investigators, Mark Fainaru-Wada and Lance Williams, in producing their book Game of Shadows (Gotham 2006), pointing to the baseball establishment’s attempt to downplay the damning evidence. Dellinger’s revelations in the case of the 1919 scandal support Carney’s work in demonstrating the owners’ unwillingness break up the fix and call off the Series despite their own “guilty knowledge”—something that later got their players banned from baseball. Why not blow the whole thing open? Because dropping the suspect games would have cost the owners a lot of money, and their pockets were more important to them than the probity of the national game. They let the string be played out. As a vehicle for presenting her evidence of the Cincinnati connection to the 1919 Scandal, Dellinger uses the appealing story of her grandparents, Edd Roush and his wife Essie Mae. She steps back in time to set the scene for the life of the young and unsophisticated Roush couple, beginning with Edd’s ascent from a town ball player in little Oakland City, Indiana, earning a dollar a game, up to his entry into the bigs and his hiring by the Cincinnati Club, where he became a fixture. Edd showed his determination to “make good,” and Essie backed him all the way despite his constantly annoying the owners, fans, and reporters with long holdouts during salary negotiations, holdouts that might have delayed his entrance into the Hall of Fame in Cooperstown. Although with this book Dellinger has made substantive contributions to baseball history, she still thinks of it mainly as the story of her grandparents. During an effective presentation I heard her make before the Naples, Florida, chapter of the Society for American Baseball Research, she called her book “a love story.” And it is. But baseball historians and serious fans will find the research she has done into the 1919 scandal to be paramount because it presents compelling evidence of Cincinnati’s important contribution to the attempt to subvert the honesty of players of both teams in the 1919 World Series in Cincinnati. Dellinger inserts into her historical narrative certain “hypothetical” scenes that she believes present what must have happened. The reason for including unhistorical scenes is a good one. Nobody knows exactly who said what to whom at every point in the scandal, but from interviewing relatives of participants in the dark events of the scandal, and from studying the already-known facts of the case (as far as they can be known) in the most recent sources, Dellinger reconstructs what the crooked plotters and other characters might have—or even must have—said to each other at certain points in the story. And by referring to her interview notes, she has a pretty good idea of what people were thinking and when. Dellinger isn’t the only biographer to stretch her sources by means of recreating moments; have you read Richard Ben Cramer’s Joe DiMaggio (Simon & Schuster, 2000)? Cramer crawls right inside Joe’s brain. The resulting scenes and conversations that Dellinger calls “hypothetical” assist in moving the story along. They help the reader identify with the star Cincinnati player Edd Roush as he begins to realize with dismay during the World Series that some of his friends and colleagues were crooked. In gathering her evidence Dellinger had the great advantage of having been born the granddaughter of the dour-faced Roush and so able to ask him what he knew and remembered about the scandal. Roush’s wife, Essie May, also knew and recalled a great deal, but even better, Essie luckily kept voluminous scrapbooks of newspaper clippings as well as diaries so that Dellinger could compare the remarks of contemporary writers in the cities where Edd played with the other information she dug up and could insert Essie’s reactions from her diary. How lucky can you get with your forebears? Dellinger, although not a historian, holds a doctorate in psychology and understands the importance of wide research, building background, setting a scene, and letting her story lead to its inevitable fascinating ending, thus rounding it out for the reader. Her informative chapter notes don’t just cite sources, they give additional details, many of them juicy. Her writing is facile (she’s published other books) and, despite some grammatical lapses, carries the flow of the striking narrative. Dellinger also knows baseball and even picked up the sporting terms of the time (“doping,” “bleacher bugs”). Her publisher could have helped more by finding the typos. All authors inadvertently suffer writing lapses. In Baseball: The Golden Age (Oxford University Press, 1990) my late husband Harold Seymour and I spelled Roush’s name “Rousch.” Oops. In Red Legs and Black Sox Dellinger unwittingly feeds into ethnic stereotypes by failing to quote contemporary sources when she describes a group of crooked gamblers this way: “They had something else in common—they were all Jewish.” If she had permitted her sources to say this (as they did), she would not have fallen into a writing trap that makes her sound dated and prejudiced. Nearly the same thing happens when she explains her grandmother’s desire to avoid going to the Chicago games by saying: “And, to Essie, there was always fear of that ‘element’—big-city negroes.” Essie’s fear might have been understandable, but it could have been described better. Less grating is her explanation of player Larry Kopf’s last name as deriving from a German phrase, dummer kopf. Actually, the German word Kopf simply means head, just as the Italian word Testa means head. Both are used as family names. In building her book, Dellinger includes useful and related photos never seen in other publications; they lend to her story the flavor of the period. She writes a neat Epilogue and includes Roush’s playing record in an Appendix. For convenience, I wish she had also provided an Index. 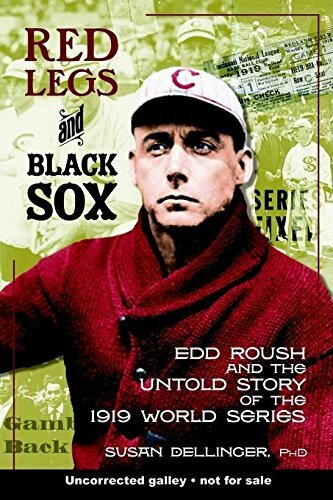 Are fans and scholars really still interested in the Black Sox Scandal? Indeed they are. Obsessed fans flock to the home of the banned player Shoeless Joe Jackson, which has been turned into a museum, in the hope of learning more about him. For eighty years we have been reading books and articles and seeing films on the subject of the Black Sox. And not just from American writers and producers: I have received queries from scholars in England and Scotland for information on how to research the scandal. This book represents a rich contribution to the published material on the subject. Dorothy Seymour Mills is the author of Chasing Baseball: Our Obsession with Its History, Numbers, People and Places (McFarland, 2010).